Ducky 17 is a small brother of Ducky 19. This catamaran will bring you much genuine sailing fun. Your crew will also find work to do, as this model has a jib in addition to the mainsail. At the client's request, it can also be equipped with a gennaker. As well as Ducky 19, this catamaran can be used for challenging long term cruises in varied sailing environments. 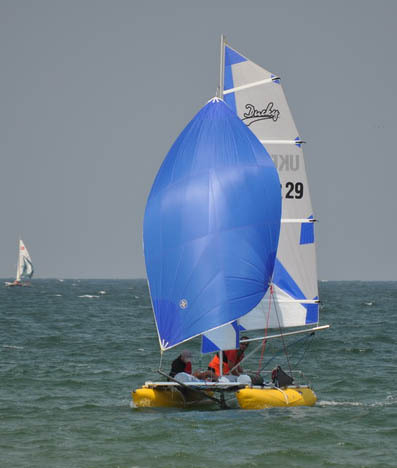 Unlike its senior brother, this catamaran has a simplified construction. It is lighter and easier to assemble, an important factor for crews of 2 or 3 persons. Assembly and disassembly require no tools. 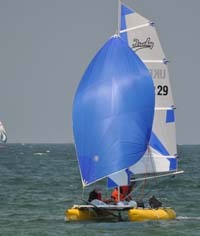 The catamaran allows using an outboard motor up to 4 hp. A special transom fastens to the stern beam to support this configuration. 1.95 x 0.25 x 0.25 m.
0.9 x 0.6 x 0.4 m.
0.6 x 0.4 x 0.3 m.